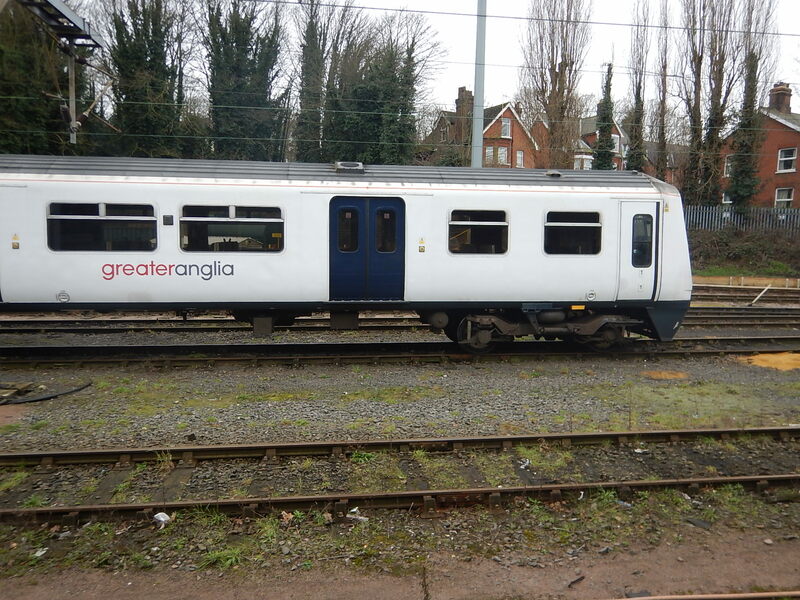 A hundred and seventeen Class 321 trains were built around 1990 and a hundred and four, which are currently in service with Greater Anglia, are due to be replaced by new Class 720 trains. Alstom and the trains owners; the Eversholt Rail Group, plan to convert some of these trains to hydrogen power. The basic characteristics of these trains are as follows. They have a 100 mph operating speed. They are built for operation on 25 KVAC overhead electrification. The closely-related Class 456 trains can run on 750 VDC third-rail electrification. They have a formation of DTCO+TSO+MSO+DTSO. Note that only the third car is powered. Thirty of the trains have been refurbished in the Renatus project, which includes an upgraded interior and a new traction package, which includes regenerative braking. This picture shows on of the driving trailers of a Class 321 train. Note the large amount of space underneath. If the Class 321 train has a problem, when converted to a modern efficient train, it is that the front end of the train has the aerodynamics of a large brick outhouse. I don’t know the electrical system of a Class 321 train, but I do know that of the Class 319 trains, which were built a couple of years earlier in the same factory at York These trains have a 750 VDC bus from one end of the train to the other. As Class 321 and Class 319 trains have a similar train formation and a common Mark 3 heritage, I suspect that the electrical systems are the same and both have this 750 VDC bus. Regenerative braking is an important part of any modern train, as it saves energy. Normally, the energy generated as a train stops, is returned through the electrification to power other nearby trains. But with a hydrogen-powered train, that may not be connected to the electrification, the energy has to be stored on the train to avoid being wasted. Alstom have developed a hydrogen-powered version of the Coradia Lint train, which they call an iLint. This promotional video shows how Alsthom’s hydrogen-powered Coradia iLint works. Summarising, Alstom’s video the Coradia iLint works in the following way. The hydrogen fuel cell turns hydrogen gas into electricity. The electricity is used to power the train or is stored in a lithium-ion battery. The computer on the train monitors the system and controls it in an intelligent manner. I wouldn’t be surprised to find out the system works in the same way as a serial hybrid vehicle like a New Routemaster bus. The power source; hydrogen fuel cell in the train or small diesel generator in the New Routemaster, charges the battery directly. The power source shuts down automatically, when the charge in the battery reaches a certain high level. The power source starts up automatically, when the charge in the battery reaches a certain low level. The battery moves the vehicle using one or more electric traction motors. The battery powers all the other systems in the vehicle. When the vehicle brakes, the traction motors generate electricity, which is stored in the battery. The great advantage of this system is its simplicity, as the vehicle is effectively powered from a single source; the battery. There is also an independently-controlled charging system for the battery. Hydrogen powered trains need the following components. Fuel cell to convert hydrogen to electricity. Battery to store energy from both the fuel cell and regenerative braking. Intelligent control system to control everything. Positioning the last item shouldn’t be a problem, but could the other three larger components be placed under the train? There’s certainly plenty of space under the two driving cars. The battery would be connected to the following. The 750 VDC bus to power the train. The train’s computer would control the systems intelligently. Class 321 trains were designed as electric trains and I’m certain they could be made to run on 25 KVAC overhead or 750 VDC third rail electrification. The electrically similar Class 319 trains are being converted into bi-mode Class 769 trains, so I wouldn’t be surprised to see the hydrogen-powered Class 321 trains being able to use electrification directly. How large would a battery need to be to store energy from both the fuel cell and regenerative braking? I will start by calculating the kinetic energy of a Class 321 train, as the battery must be able to store all the energy generated by regenerative braking, when the train stops in a station from an operating speed of up to 100 mph. A train can accommodate a total of about 320 seated and standing passengers. With bags, buggies and the other things passengers bring on, let’s assume an average passenger weight of 90 kg, which gives an extra 28.8 tonnes. So I will assume that an in service Class 321 train weighs 176.7 tonnes. Calculating the kinetic energy of the train for various speeds gives. Note that speed increases the kinetic energy much more than weight. This is because kinetic energy is proportional to the square of the speed and only proportional to the weight. Even if the extra equipment weighed twenty tonnes, the kinetic energy at 100 mph only increases to 51.8 kWh. As the battery will have to store this energy after a stop from 100 mph, I suspect that the battery will have a capacity somewhere between 50 and 100 kWh. A Bombardier Primove 50 kWh battery, which is built to power trams and trains, has the following characteristics. I conclude that Alstom won’t have any problems designing a battery with sufficient capacity, that can be fitted under the floor of a Class 321 train. The hydrogen-powered Class 321 train could have up to four methods of charging the battery. From the hydrogen fuel cell. The computer would try to ensure the following. There was always spare capacity in the battery to accept the energy from regenerative braking. Trains stop in a station with a full battery. The computer might even be programmed with the route and use GPS or digital signalling to optimise the train to that route. It’s all very basic Control Engineering. Watch Alstom’s video embedded in this post and they stress the environmental credentials of hydrogen power and particularly the Cordadia iLint. They also show a caption which states that 195 states have made a commitment to zero carbon emissions. The Coradia iLint will probably be a good train, but I suspect it may have a few problems satisfying a large market. It is only two cars. The current design can’t work on overhead electric power. It is based on a Lint 54, which has only 160 seats. Operating speed is 140 kph. They are new trains and manufacturing may be expensive. On the other hand, Class 321 trains have the following characteristics. They are four car trains. The trains can work from 25 KVAC overhead electrification. The trains are built to a smaller loading gauge than the iLint. I suspect that they could be easily converted to other overhead and third-rail electrification voltages. Each train has 309 seats. Operating speed is 160 kph. They are existing trains and manufacturing may be more affordable. It should also be said, that there is a massive amount of knowledge accumulated in the UK over thirty and more years, about how to refurbish, modify and update Mark 3-based rolling stock. Once the concept of a hydrogen-powered Class 321 train is proven and certified, Alstom would probably be able to produce four-car hydrogen-powered trains at a fair rate, as they become available from Greater Anglia. The Class 321 train will make a good hydrogen-powered train. Alstom would not have looked at converting a thirty-year-old train to hydrogen power, if they thought it would be less than good. British Rail’s design of a 750 VDC bus makes a lot of the engineering easier and enables the train to be tailored for world-wide markets, with different electrification systems and voltages. Having two different trains will give Alstom better coverage of an emerging market. I suspect in a few years time, if the hydrogen project is successful, Alstom will design and manufacture, a whole family of hydrogen-powered trains, with different gauges, capacities and operating speeds.